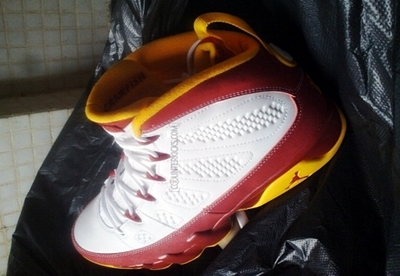 Jordan Brand is really looking to make noise with their Air Jordan 9 lineup earlier this year. Aside from the Cool Grey, Olive, and Johnny Kilroy, another one has recently surfaced and is getting a lot of attention. The new Air Jordan 9 is somehow related to the Johnny Kilroy edition, which will be dubbed as the “Crawfish” edition of the kick. The kick features a white and varsity red upper with several areas applied with University gold accents plus a “Crawfish” stitching inside the tongue. The fictional character Johnny Kilroy, who became famous during Michael Jordan’s retirement, played for the Crawfish team. Expect a release date to be announced soon! Stay Tuned for Another Air Jordan 14!